Gareth Porter, author of Manufactured Crisis: The Untold History of the Iranian Nuclear Scare, is a renowned investigative journalist and historian on U.S. national security policy. Porter was the 2012 winner of the Gellhorn Prize for journalism awarded by the Gellhorn Trust in the U.K.
His previous book was Perils of Dominance: Imbalance of Power and the Road to War in Vietnam, published by University of California Press in 2005. He has taught international studies at the City College of New York and American University, where he was the first Academic Director for Peace and Conflict Resolution in the Washington Semester program. Foreign Policy Concepts spoke with Dr. Porter to discuss his newly released book. Given the current negotiations between Iran and the P5 +1, the publication of your book could not have been timelier. What motivated you to write this book and when did you start working on it? I began to think about writing a book on the Iran nuclear issue more than three years ago, because I had come to realize that the news media account of the issue had been terribly misleading, and that the true story could only be told properly in a book length treatment. The real trigger for my beginning to think along those lines was the discovery of evidence that the crucial evidence in the official and media account had been falsified. In the beginning of your book you assert that the single most historical fact about Iran’s nuclear program was falsified in the media; and Iran’s uranium enrichment was a direct response by Iran to a U.S policy that challenged Iran’s right to have any peaceful nuclear power program at all. How did this U.S. policy take shape and what was the rationale behind it? The beginning of the U.S. effort to stifle the Iranian nuclear program came about because of the U.S. unwillingness to accept the Islamic revolution in Iran and the Reagan administration’s support for Saddam’s Iraq in the war against Iran beginning in the early 1980s. The U.S. intervention with France and Germany to refuse to honor agreements with Iran for nuclear cooperation was based on nothing more than opposition to anything that would benefit the modernization and growth of Iran and an aspiration for eventual regime change. The United States admitted quite openly that it had no evidence whatever that Iran had violated the NPT or its Safeguards agreement. And that explicit U.S. denial policy forced Iran to alter its original plan for its nuclear program and decide that it would have to have its own national capability for uranium enrichment. “Netanyahu never intended to use military force against Iran, and the Obama administration was well aware of that but was hoping to exploit the threat to gain diplomatic leverage on Iran”. With this quote in mind, how would you describe the nature of Israeli-Iranian rivalry in the Middle East? Is it ideologically and religiously driven, or is it a strategic rivalry based on quest for regional dominance and supremacy? It is neither ideological nor religious in its essential dynamic. And there has not even been consensus in Israel that Iran represents an inevitably geopolitical rival. My research shows clearly that what is thought of a rivalry has been driven primarily by opportunism on the part of the Israelis. All Israeli governments beginning with Rabin’s have recognized that conjuring a mortal struggle with Iran is a ticket to keeping the special relationship with the United States strong and a potential strategy for reducing Iranian power through a U.S.-Iran military confrontation. But it has also served domestic political purposes in Israel – justifying wholly different policies toward the Palestinian struggle. Iran’s “possible military dimensions” as one of the sticking issues in the current nuclear negotiations must be resolved—according to the White House—to the satisfaction of the International Atomic Energy Agency (IAEA). In your conversations with the former German Foreign Office coordinator of North American-German relations, Karsten Voigt, the documents at the hands of the IAEA that point to the presence of such covert military program come from the Iranian dissident group, Mojahedin-E-Khalq (MEK) organization. Tell us about your conversations with Mr. Voigt, how credible these documents are, and if they will be used in the current negotiations? Karsten Voigt provided the most crucial revelation in my book – that the documents that had been described in the news media as having come from the purloined computer of a scientist participating on a covert Iranian nuclear weapons research program, were in fact given to the BND, the German intelligence agency, by the MEK, and that the BND had concluded that the MEK source was “doubtful”. Voigt, who is now retired from the German Foreign Office, told me in an interview last year that senior officials of the BND informed him of that fact in November 2004 after Secretary of State Colin Powell had spoken publicly about Iranian efforts to combine their ballistic missile, the Shahab-3, with a “weapon” – meaning a nuclear weapon. They knew that Powell was referring indirectly to information in those papers and they were alarmed, because it appeared that history was about to repeat itself: Powell had cited information from another MEK source two years earlier as the centerpiece of his rationale for war in Iraq. That source was the now infamous “Curveball”. The BND had tried in vain to warn the CIA not to rely on that information, and Voigt believed they now wanted him to do something to warn the United States not to use the information in the “laptop documents” either. Voigt did, in fact, try to do so. But in the event, the Bush administration pushed those documents on the IAEA and they became the basis for that Agency’s indictment of Iran’s nuclear program from 2008 to 2011. 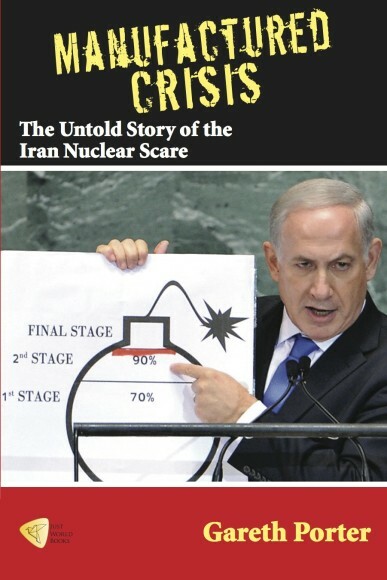 The complete story of those documents in the book, however, includes the evidence I found in my investigation that they were fabricated by Israel in order to advance a strategy of provoking a military confrontation between the United States and Iran. In your book you write that as far back as Clinton administration, “the U.S. tried to align its Iran policy with that of the Israeli government of Prime Minister Yitzhak Rabin”, to the point that Rabin, through his foreign minister Shimon Peres, pressured the Clinton administration to present Iran as “Enemy Number 1”. Why did the Clinton administration decide to adopt this policy and was Iran’s nuclear program factored in Israel’s strategic decision making at the time? I analyze the Clinton administration’s adoption of the Israeli view of Iran as a convergence of two factors: the interests of the national security bureaucracy – especially the CIA and the Pentagon – in having a regional power (Iran) as substitute for the Soviet threat that had been lost when the Soviet Union collapsed and the domestic political clout of the Israel lobby, which transformed a former propagandist for an Israeli prime minister into Clinton’s most influential Middle East adviser. The Clinton administration’s descent into the acceptance of the Israeli propaganda line is a cautionary tale about how factors other than reality on the ground have shaped U.S. Iran policy. Do you believe the recent requirement from Iran by the West to clarify issues related to its ballistic missile program has the potential to derail the current negotiations? As far as I know this requirement was not part of the November 24 interim agreement. No, I don’t believe the administration will press that demand for negotiation on the Iranian ballistic missile program. That demand appears to me to be a political sop to the Israel lobby that the administration knows will not be acceptable to its negotiating partners in the P5+1 –especially Russia. How much support does a potential Iranian-Israeli rapprochement have within Israel’s foreign policy circles and among pro-Israeli lobbies in the U.S., perhaps outside of AIPAC? The hope that Iran could once again be an ally of Israel against the Sunni Arab regimes, as it had been during the Shah’s regime, remains a significant current of thought within Mossad in particular. But it has long been based on the wholly unrealistic belief that Iran was about to revert to a secular regime, so it is not likely to have any influence on Israeli policy. What is your assessment of the Rouhani administration’s determination in ending the nuclear crisis? Do you think the future of his presidency depends on how he defuses the nuclear crisis and lifts the sanctions? Certainly the fate of these nuclear negotiations is a crucial factor in the evolution of Iranian politics. If they succeed in reaching an accord, the Rouhani government will certainly reap political benefits. If they fail, the political impact in Iran will certainly depend on whether Rouhani is perceived as having sought to end the nuclear-related sanctions without ceding Iran’s nuclear rights. That is why Rouhani and foreign minister Javad Zarif have been at pains to state Iran’s “red lines” early in the process. “The complete story of those documents in the book, however, includes the evidence I found in my investigation that they were fabricated by Israel in order to advance a strategy of provoking a military confrontation between the United States and Iran”.